While I still receive a box of local foods each week, I have to admit that I haven’t selected many items that required actual cooking. For example, one of the vendors is a bakery that offers delicious scones. In the great debate of kale vs. scones, the scones won. So what possessed me to order the oyster mushrooms? I don’t know. I guess it was one of the few times I had seen mushrooms of any kind on the list and I like to try out food from new farmers. I was unfamiliar with oyster mushrooms and rather surprised by the enormous size of the item in the plastic clam shell box lurking in my refrigerator. I was about to forgive my ordering mistake and throw it out, but then thought, no, I’ll try to cook something with it…to my delight, I found a recipe that used not only the giant mushroom but also the guilt-inducing bag of spinach (also from the co-op). The recipe was actually very good – who knew? Three out of four family members liked it (and the fourth didn’t want to eat it at all as it contained mushrooms). I would make a few changes in the future (like substituting a more conservative mushroom) and increasing the amount of sauce, but the flavor was nice. And, I didn’t even notice the oyster mushrooms once they were cooked. The original recipe, from Martha Stewart, makes a large 9″ x 13″ pan of lasagna. I was at the mercy of the quantities of spinach and mushroom that came from the co-op, so I halved everything. 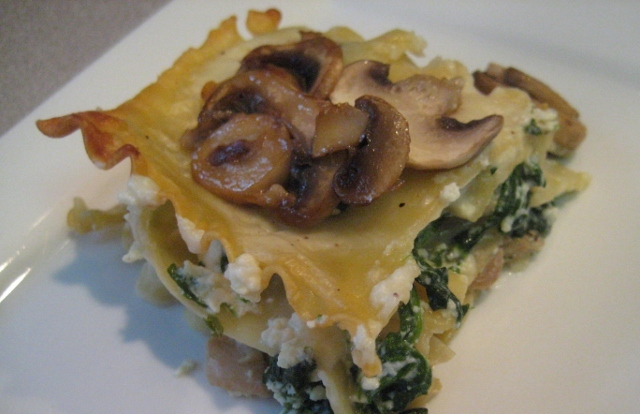 I also made a few substitutions to match the existing items in my pantry: sherry for the Madeira, Parmesan for the Romano, boring lasagna noodles for the fresh spinach ones, and button mushrooms for the topping (a marketing move on my part). Click here for the real recipe. I’m sure the published recipe is good too! This past weekend, we had the opportunity to sample local NC products at the Carolina Artists Colony here in Sanford. The foods were delicious, and I came home anxious to try out the new items. While I tend to buy fresh NC produce from my food co-op, the NC foods at the Artists Colony centered around jarred yummies like salsas, sauces and jams. First on the cooking agenda is a chili based on Cane Mountain Farms’ Fresh Tomato Salsa. The sample we tried had ground beef, and I was planning to add some local NC grass-fed beef to my version, but decided to go vegetarian at the last minute. Mixed salad greens are the starring local foods of the week. 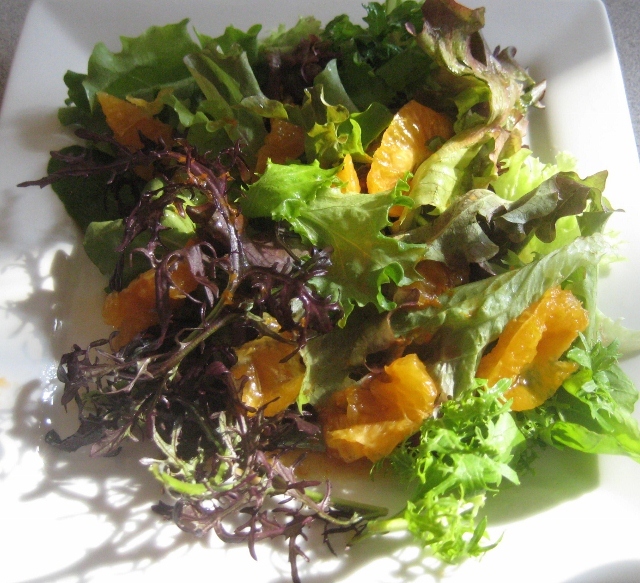 Full of beauty and variety, they make a gorgeous salad even with limited toppings (like tangerines). We affectionately call the salad from the co-op “Russian Roulette Salad.” While many of the leaves are mild, there are a few greens with an amazingly bitter punch. They add a bit of danger and excitement to salad eating. I suppose one could take the time to taste test each type of green to figure out which ones are problematic…but that would take all of the fun out of it! Lacking any other salad worthy fresh vegetable, I turned to the bowl of tangerines on the counter (did you know that 40 lbs of tangerines bought to support the local high school marching band are a lot of tangerines?). I made a vinaigrette with the juice and zest of one tangerine and sectioned another to add to the greens. Very fresh and delicious (minus the one roulette bite…)! This week’s lite local food is the Carrot. Because the co-op took a few weeks off over the holidays to revamp their systems, I needed to draw on my refrigerator’s inventory for something to make. I found local potatoes, garlic, and quite a few carrots. As carrots are one of the foods that I can’t eat raw, I considered several cooked options (like ginger carrot soup or traditional glazed carrots). I chose the roasted version because, well, I just like roasted carrots (and their friends, roasted onions and potatoes). Delicious! Pre-heat the oven to 400F and line baking sheets with foil. Gently toss the carrots, potatoes, and onions with enough olive oil to coat (but as little as possible), garlic and rosemary. Spread the veggies out on the baking sheets and season with salt and pepper. Roast for 40 minutes or until desired brownness. The Carolina Locavore is going Lite for 2012. Instead of focusing on trying to eat only local foods (or 80% local) and cooking from scratch, I have reduced expectations for 2012. I’ll be happy cooking a recipe or two a week highlighting locally grown foods. The other objective is to feature waistline friendly recipes. Spending hours on end cooking (and eating) followed by months of consuming fast food during election campaigning have left me unable to fit into my favorite black pants. While I have temporarily solved the problem by purchasing new black pants, they aren’t the same as “favorite black pants.” So, the recipes will be on the lighter side. 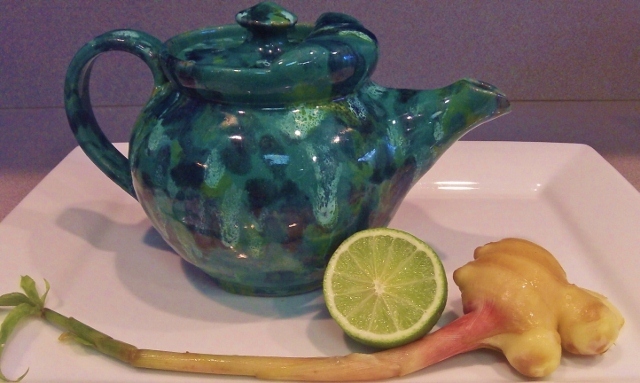 Today’s recipe is about as light as one can go…Baby Ginger Lime Tea. No, the lime is not local, but the ginger is! Baby Ginger is picked at a younger age than mature ginger – the skin is thinner and lighter, and the texture is less stringy. The taste is also more gentle. Gentle ginger is a plus because one of my previous attempts at Ginger Tea left us all feeling as though our throats were seared. No throat burning with this version, and the lime is a pleasant touch! For stronger tea, feel free to increase the quantity of ginger and/or the steeping time. Thinly slice the ginger (I used 7 g of ginger but I was cautious! Feel free to try more) and set in the tea pot. Add 3 cups of water and let steep for 15-20 minutes. Add a bit of lime juice to taste( I used the juice of about a sixth of a small lime). Enjoy! Have you ever had a head of cauliflower miraculously appear in your refrigerator? This strange but true event happened to us recently when we returned from vacation. I’m sure it isn’t a common occurrence, but if it happens to you, I recommend making Cream of Cauliflower soup. This soup was a delightful surprise, as it tasted quite good and not much like cauliflower at all. (I’m not a big fan of cauliflower and my last recipe experience with it was the South Beach recipe that attempted to pass off cauliflower as mashed potatoes (not a successful experiment in my opinion…)). Melt butter in a large pot. Add onions and garlic and cook about 5 minutes. Add potatoes and carrots and cook for 5 more minutes. Pour in vegetable broth and bring to a boil. 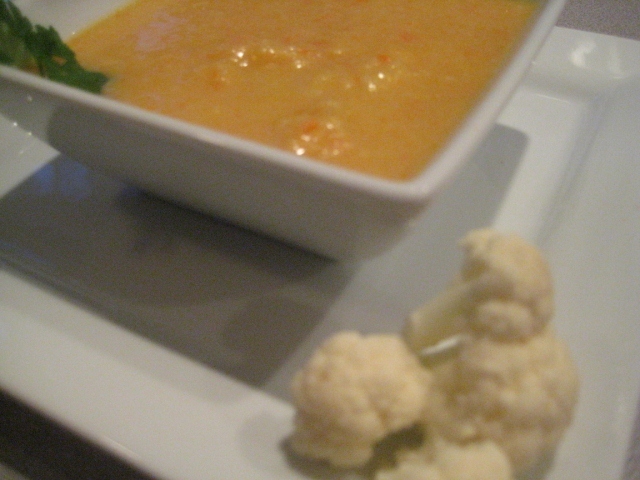 Stir in cauliflower, reduce heat, cover, and simmer until cauliflower is tender (about 2o minutes). Remove from heat and puree soup. Return to low heat and add milk and sherry. Season with salt and pepper and, once heated through, serve and enjoy! I’m not sure which is more exciting – my apple squash casserole or the apple peeler I bought which had this recipe in their instruction book. OK. I am sure – it is definitely the apple peeler. What an amazing invention! I found a website dedicated to its history…but I’ll save that for another post when I take some pictures of the apple peeler in motion…our apple consumption has skyrocketed since the addition of the apple peeler to our home. This phenomenon also may have been influenced by my purchase of 40 apples…but why quibble? At any rate, the recipe book had ideas for apple pie, shoestring potatoes, and a bunch of delicious sounding apple dishes. It also had one for butternut squash…with my mounting squash collection, it looked like a good choice. Pare, seed and cut the squash into small slices. 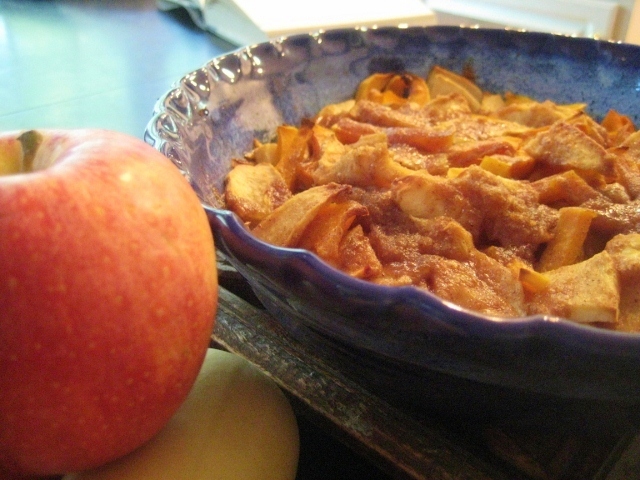 Place the squash and apple slices in a baking dish. Blend the rest of the ingredients together until crumbly. Sprinkle over the squash. Cover and back at 350F for 45 to 50 minutes. 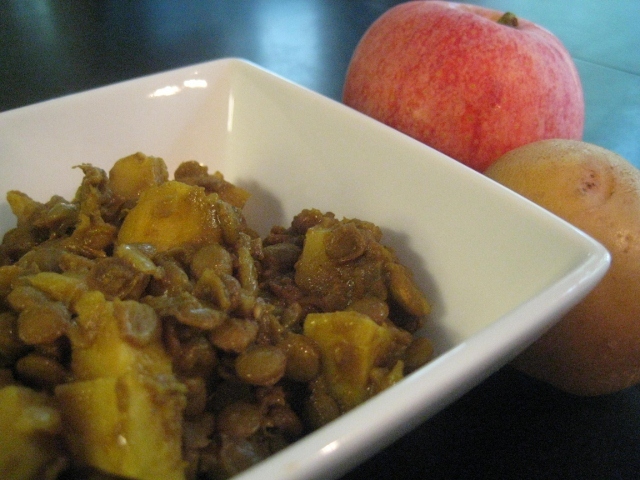 The lentils are back – this time in a sweet curry with potatoes and a gala apple from the the co-op. I started this morning by cooking a pot of lentils – didn’t measure, just followed Mark Bittman’s advice in Food Matters to cover with a couple of inches of cold water and cook until done. Further along in the book, Bittman offers a recipe for Curried Lentil Soup with Potatoes. I started with it, but as usual diverged quite a bit. The result was a non-offensive, almost tasty lentil dish (not a soup). We ate it as a stand alone dish, but it could have easily been made more liquid and served over rice or other grains. Heat the oil and add the onion. Cook until translucent. Add the garlic and cook another minute or so. Season with salt and pepper. Add the ginger and curry powder. At this point add the lentils, some cooking liquid and a bit more water. Next add the potatoes and the apple and simmer until they are tender. During the process, I added enough water to keep it liquid and ended up putting in about 2 T of sugar to counteract a slight harshness. The result was sweet and not too bad :). While I still can’t eat raw apples, I love them cooked. This morning’s project was a batch of apple muffins for Annie (Ginevra is a huge fan of the cheesy egg things). 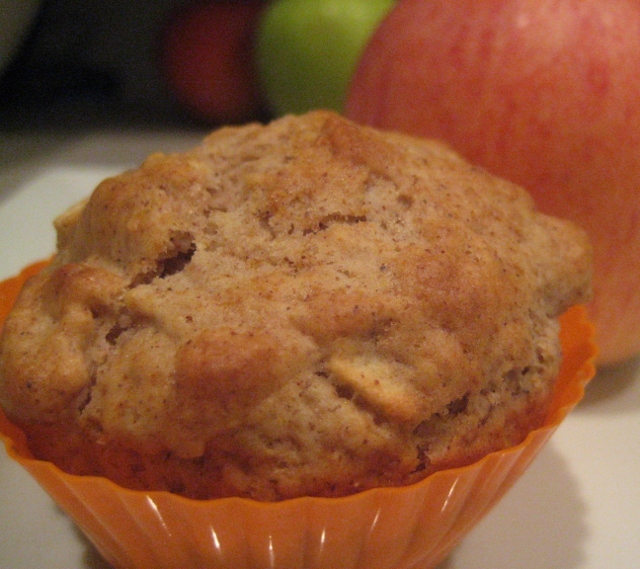 This is my first attempt at apple muffins and I opted for a variation on two recipes. While the muffins were quite good, I will probably tweak the spices and the sugar content. I ordered 40 Gala apples from the co-op so I’ll have plenty of chances to experiment. 1 c peeled, chopped apple. Preheat oven to 400F. Grease 12 muffin tins (I use silicone liners). Combine flour, sugar, baking powder, cinnamon and salt. In a separate bowl, combine milk, oil, and egg. Add to dry ingredients and stir until moist. Add the chopped apple. Fill the muffin cups. Bake until done, approximately 20 minutes. While cooked lentils aren’t particularly beautiful to look at, they do have a resemblance to ground beef. Ironically, ground beef can be local while lentils are not, but the health and environmental benefits of the mighty lentil make a certain amount of experimentation worthwhile. So I have begun a quest to try out lentils in place of ground beef in a variety of recipes. (Don’t worry, no hamburgers will be replaced by lentils in this experiment). First up is the taco. Inspired by 49 cent taco seasoning at the Food Lion, I reheated some previously frozen lentils (I cooked a lot of lentils the other weekend!) and added the taco seasoning. It tasted reasonably close to taco meat and under copious amounts of toppings who would know the difference? Actually, one person – the house vegetarian, who liked it a lot. We substituted cucumbers for the lettuce as we had no lettuce and three cucumbers were left from the weekly produce box. This was a nice addition and sparked thoughts of Tzatziki sauce – with some tweaking of the spices, we could go in a new direction! 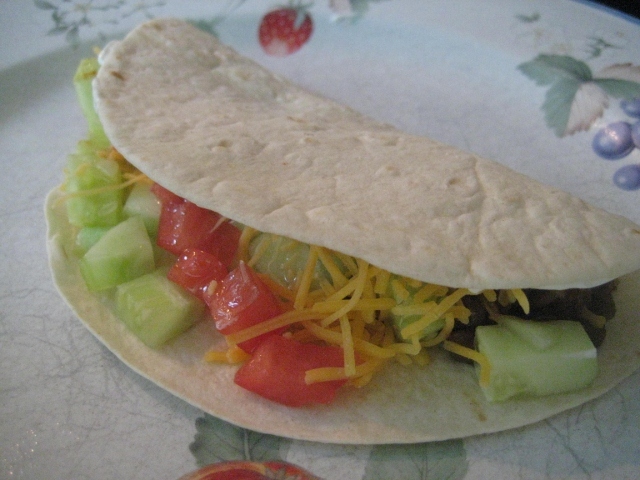 Anyway, this taco version wasn’t particularly local or homemade, but there is no reason it couldn’t be next time around! The general verdict was that we should have lentil tacos often (and skip the beef…). 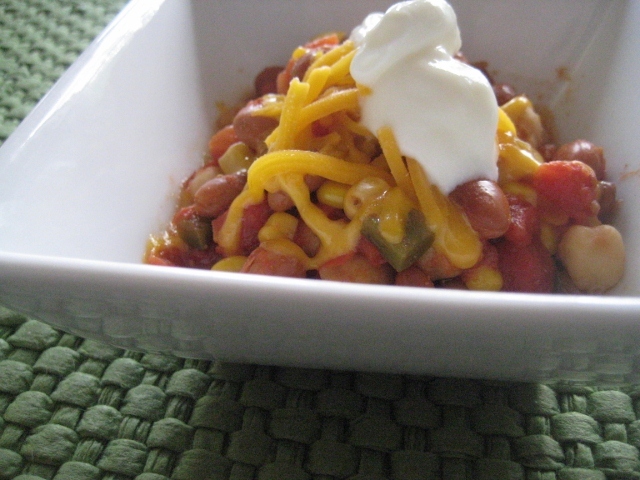 Toppings of your choice: cheese, sour cream, tomatoes, random seasonal veggies, salsa etc. Heat the lentils and add the seasonings. Layer the lentils and toppings on the tortilla, fold, and enjoy!